The Sea Trail Golf Plantation Maples Course is a one of a kind course that is often referred to as the finest Dan Maples ever designed. Featured in several publications such as NC Magazine and Golf Digest, this course has received several well-deserved honors. 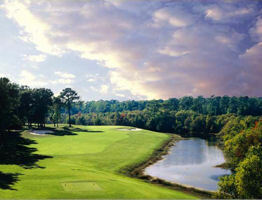 Carved into the natural landscape of surrounding Mother Nature, this course meanders its way down the Calabash River, providing a stunning look from five of the eighteen holes for the ultimate in scenery and refinement. Newly renovated with a combination of A1/A4 Bent grass greens, this course provides hours of golfing challenges, fun, and beauty. Nothing compares to the unique surroundings of the creeks borders and rows of Carolina pines. As an added treat, golfers will be treated to the sighting of native nesting ospreys and other wildlife creatures that inhabit the area. Players cannot help but take a pause to look out over the river or to snap a picture of some of the local wildlife. A number of scattered waste bunkers create the perfect challenge for players that wish to spread their legs and flex their skills. One hole features a waste bunker that extends the entire length of the fairway so that precision and accuracy is a necessity to keep the ball on track for the best approach toward the green. Unique doglegs create impressive challenges that leave a lasting impression. By the time a player putts out, they will feel a sense of rewarding fulfillment that cannot be acquired anywhere else on the Grand Strand. The Sea Trail Golf Plantation Maples Course is a one of a kind course that is often referred to as the finest Dan Maples ever designed.